If you ask most people what is on their Thanksgiving table, chances are that green bean casserole will keep coming up, again and again! A classic all-American side dish, this quick and easy casserole has been a Thanksgiving staple since Plymouth Rock the 1950s. A simple combination of green beans, cream of mushroom soup and french-fried onions, some would argue that this classic casseroleis an integral part of the Thanksgiving meal. Now, if you're gluten free like me, just about the only safe food on the ingredient list are the green beans - until now! I did some digging and found 5 fabulous gluten free green bean casserole recipes to share with your family this Thanksgiving! Using safe storebought ingredients, this recipe is better than ever in half the time! This from-scratch recipe will make you wonder why you ever missed the original. Seriously. Even better, this recipe comes with two freebies: french fried onions AND homemade cream of mushroom soup! This classic side dish reinvented! Just be sure to substitute your favorite gluten free panko or standard bread crumbs. 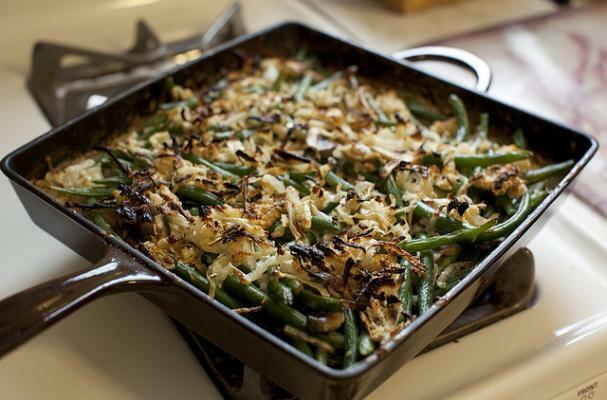 As a Brit, I've never really had green bean casserole, but this looks very delicious indeed! In the Quick & Easy Green Bean Casserole they use Kettle brand Sweet Onion chips. I had a look at the ingredients and there is autolysed yeast extract which is simular, if not actually, MSG. Many people that are gluten-free will have problems with autolysed yeast extract in the same way they would to MSG. If someone has celiacs disease even a small amount of gluten is not acceptable. Maybe try some gluten-free bread crumbs and dehydrated onions.